Changing the look of a room by replacing your furniture every few years can be expensive. If you have wood-back chairs, however, you can easily add an upholstered back and seat. The furniture will take on a whole new look, and you won't have to spend a lot of money. Measure the seat and chair back to determine the size of plywood you will need. Use the power saw to cut two pieces of plywood to size--one for the back and one for the seat. Drill holes in the four corners of the back and seat where they will be attached to the chair. Using the same measurements, cut the foam with an electric kitchen knife. Place the fabric face down on a flat surface, and place the wood and foam on top. Use sewing scissors to cut fabric for each of the wood pieces, leaving enough fabric on all the edges so it can be pulled over and stapled onto the wood. Pull the fabric up and staple it onto the corners of the wood. Staple at the center of all four edges. This will stabilize the fabric while you continue to staple it into the wood. Pull up and staple the fabric onto the wood, placing the staples close together so that the fabric will not pull away and fray later on. Turn the chair upside down. Use a power drill to attach the seat onto the chair with the wood screws. Turn the chair upright and attach the back to the chair in the same manner. 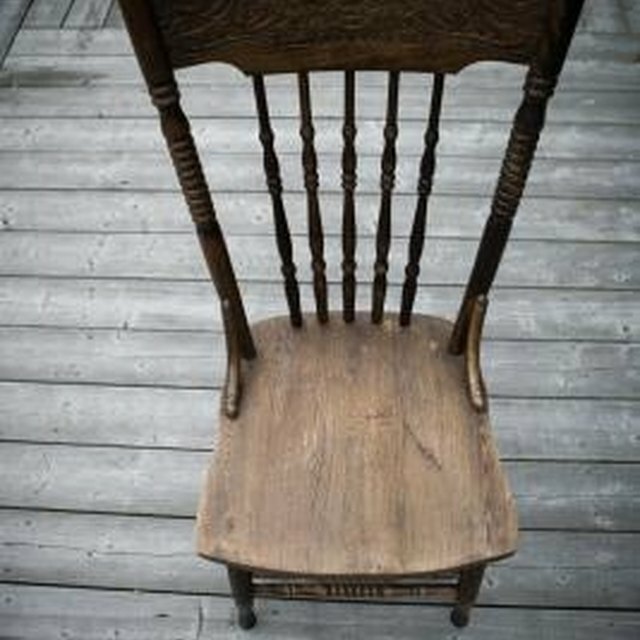 Consider painting the chair first, or by sanding and staining it before adding the upholstered back and seat.